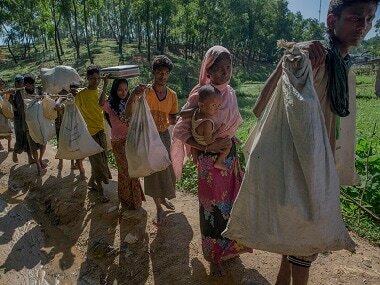 Dhaka: A Myanmar team will arrive in Bangladesh next week to discuss the mass exodus of Rohingya, an official said Tuesday, amid huge diplomatic efforts to find a durable solution to the crisis. The team are "coming early next week," Bangladesh's foreign secretary Shahidul Haque told AFP, saying they would be working on the Rohingya issue but not giving further details. A senior foreign ministry official said the team was expected to be led by Myanmar's Minister of the Office of State Counselor, Kyaw Tint Swe. Dhaka had earlier invited the minister for talks before the latest eruption of violence in Myanmar's Rakhine state triggered one of the world's worst refugee crisis in recent decades. The announcement comes as the UN said 4,80,000 Rohingya Muslims have fled to Bangladesh's southeastern border region since 25 August. Between the new arrivals and some 3,00,000 Rohingya who were already living in the area due to previous violence in Myanmar, there are now nearly 8,00,000 refugees in camps around the Bangladesh border town of Cox's Bazar that are bursting at the seams. The situation has forced new arrivals into makeshift shelters in grim conditions, and sparked warnings that epidemics, including cholera, could easily spread. The bilateral talks come as Dhaka mounts a huge diplomatic effort to find a permanent solution to the Rohingya problem and make Myanmar take back all the refugees to their homeland in Rakhine. The latest military operation was sparked by attacks carried out by Rohingya militants on police posts on 25 August. Bangladesh's prime minister Sheikh Hasina on Thursday proposed creating UN-supervised safe zones inside Myanmar to protect Rohingya Muslims fleeing a military crackdown. Hasina accused Myanmar authorities of laying landmines on the border to prevent the Rohingyas from returning and said the United Nations must take immediate measures to find a solution to the crisis. She laid out a five-point plan that called for the protection of the Rohingyas in "safe zones that could be created inside Myanmar under UN supervision." The United Nations has described the military operation as "ethnic cleansing" and French president Emmanuel Macron went further, describing it as a "genocide." Myanmar must stop the violence and "the practice of ethnic cleansing", agree to allow a UN fact-finding mission, ensure the return of refugees and abide by a report that recommends citizenship for the Rohingya, said Hasina. Rohingya are currently denied Myanmar citizenship. There has been mounting international outrage over the plight of the Rohingya, prompting the UN Security Council this month to call for an end to the violence.